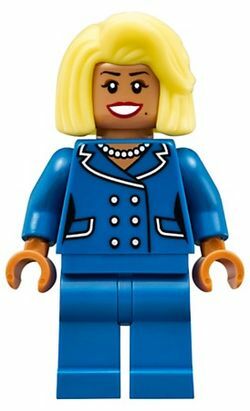 Mayor McCaskill is a minifigure released in 2017. In The LEGO Batman Movie she is voiced by Mariah Carey. Vote for Mayor McCaskill! Mayor McCaskill has a strong interest in seeing Gotham City kept safe from the criminal element, especially the trouble-making super-villains who seem to constantly plague its streets. She also has a strong interest in staying popular with Gotham City’s citizens. She is one of Batman’s biggest supporters and depends a lot on him to keep Gotham City safe. Bat-Fact: Secretly wanted to grow up to be an international pop icon. This page was last edited on 5 July 2017, at 08:38.